Many times I drive through neighbors for discoveries, observing what people build, or just taking pictures for fun. Many times I see beautiful homes and many more times I find remodeled homes that were exactly made into a job, without taking in consideration the surroundings, or the style of the house. Branding your home is just the same as your personal brand. A person with a bubbly personality mostly likely will be colorful and an earnest person most likely will wear tone down colors. Imagine the opposite and the exterior will not match the personality of the person. The same happens with homes. Sometimes I see too many details that do not fit together, or a lack of. For more than a decade American Ranch Style homes have been transformed in Mediterranean style, just with the addition of arched windows and nothing else. But Mediterranean style is much more than that. Stones on the exterior and interior are the important elements, stone window sills, recessed windows, thick walls, wood beams and so many more details. Iron, I must say is the cherry on the cake, it is the finish touch needed to complete the authentic Mediterranean look of the house. Rustic iron, iron aged with a green patina, oil rubbed bronze and plain wrought iron all seem very hard and cold, but against the stones and wood, iron is the only detail that will fit. Besides, with a small expenditure on iron details here and there, the house will acquire that certain established look as if it has always been there for ages, that look of a lived home where the walls can talk, instead of the “propped up and finished yesterday” look. I am all for history and traditions. Creating iron details in most critical areas is not very expensive, especially if all the work is done at once, volume counts and you get to see the results right away, but you also will benefit from the increased value of the house if you decide to sell it later. What are the areas to improve with iron creations if your goal is to have a Mediterranean looking home? 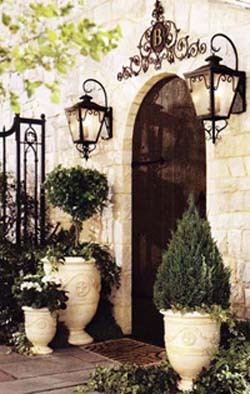 Let’s start at the front door by adding stones all around a solid wood door with all iron lighting and accessories. OK the iron crest over the door in this photo (top) is a bit too much, but your home is your castle, who can say different? 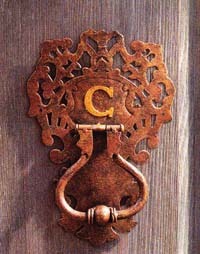 I love door knockers, I use them for decorations on garden walls, on doors different from the entry door and even as interior decorations. I have one on the kitchen wall, when I knock it, is to tell dinner is ready. Not all the windows need a trellis. The trellis in this photo indicates the room is special and needs a special treatment. 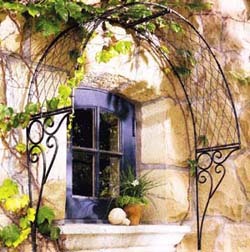 Use trellis as an accent, only to multiply the pleasure of being inside or near that particular room. Planters add interest on the exterior walls, but also allow some climbing plants to take curvy shapes up against the wall, while forming a playful nature. Let’s not forget a gate. An iron gate will give the house an aura of elegant mystery especially if you need to ring in to enter and someone answer “I am the governess”. Well OK this fantasy might not be too unreal for a few elected ones, but iron gates look very nice on smaller homes too. Of course the design of the gate itself must be proportioned to the size of the house. These are a few suggestions to guide you through thinking what upgrading you can do in your home. 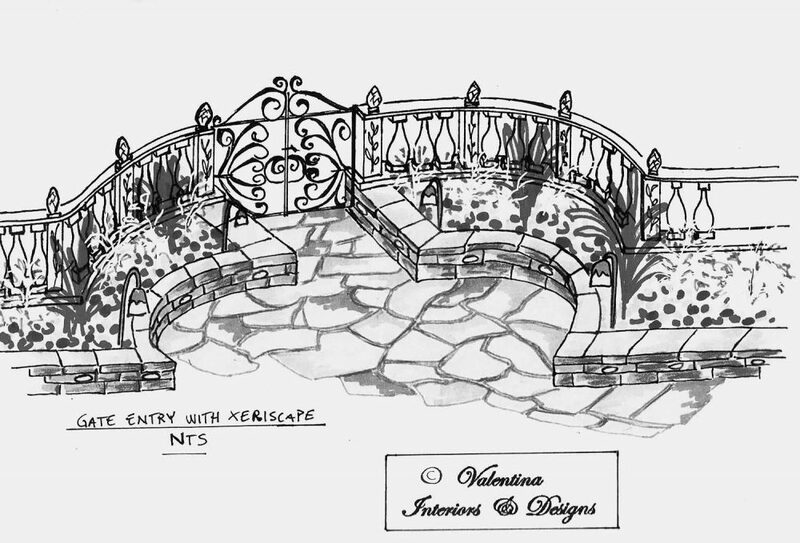 I produce designs for any kind of iron solutions that are fabricated by my trusted iron workers. Let me know if I can assist you with many more suggestions, just leave your name in the box. Your style is very unique in comparison to other folks I’ve read stuff from. Thanks for posting when you’ve got the opportunity, Guess I’ll just bookmark this page. I was extremely pleased to uncover this web site. I wanted to thank you for ones time for this particularly wonderful read!! I definitely really liked every little bit of it and I have you saved to fav to see new stuff in your web site. Good day! I could have sworn I’ve visited this blog before but after looking at a few of the articles I realized it’s new to me. Regardless, I’m definitely delighted I stumbled upon it and I’ll be book-marking it and checking back regularly! Thank you for stopping by, there will be lot more coming.